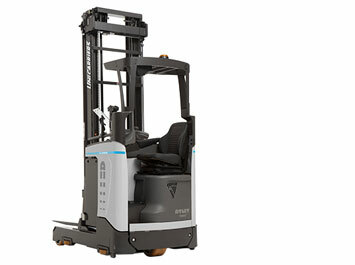 This compact reach truck is just the right tool for medium intensive operations for higher stacking levels with very good stability and performance. It is nimble and economical, and entirely designed around the operator to optimise your productivity. The UND is based on the narrow chassis, 1120 mm width and the unique wide Pro Vision mast system. This nimble, silent and powerful machine also features a superior environment for the operator. 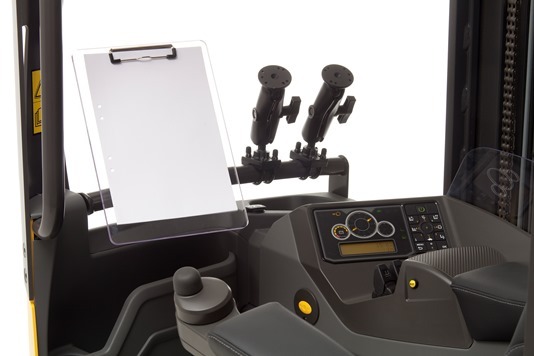 Class leading ergonomics with UniCarriers unique mini steering wheel, intuitive controls and superior visibility by means of the innovative ProVision mast design add to reduced operator strain and improved efficiency. The powerful 48V AC motor provides excellent performance – top speed is 12.5 km/h. To maximise productivity and safety, UniCarriers Truck Computer ATC3, with personal PIN code for individual performance settings, allows the reach truck to suit each operator’s driving skills. The UniCarriers S3 – Stability Support System – provides technology which ensures an unmatched industry-leading safety level. To maintain driving stability in a wide range of situations, the S3 technology continuously measures speed, steering, commands, mast movement and lift height of the truck. The new feature DCC – Dynamic Cornering Control- modifies the relationship between the speed of the truck and the operator´s steering wheel movements, allowing a higher level of cornering speed and when handling loads at high levels, the Optimised Performance Control adapts the tilt and reach speed to maximise stability and safety. Everything from design, technology and performance, to service and financing has been created to fulfil the needs and wants of the world’s most demanding truck users in the most personal way.